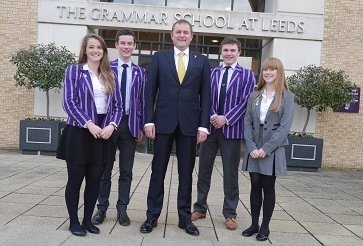 Gary Verity, the man who put Yorkshire firmly on the world map this year thanks to his role in bringing Le Tour de France to the county, was the guest of honour at Speech Day. Leeds Grammar School old boy Gary is chief executive of Welcome to Yorkshire, and he delivered an inspirational address to the audience of students, parents, staff and governors at Leeds Town Hall, before presenting prizes to upper sixth students. Gary talked of how he dreamed of bringing a big sporting event to Yorkshire, having seen the impact on other cities and regions when they hosted major sporting events. His personal experience gave real weight to his key message to the young people in the audience – work hard, be enthusiastic and never give up. During the day Gary visited GSAL, the first time he had seen the school at Alwoodley Gates, and toured the site with the head boy and girl team.